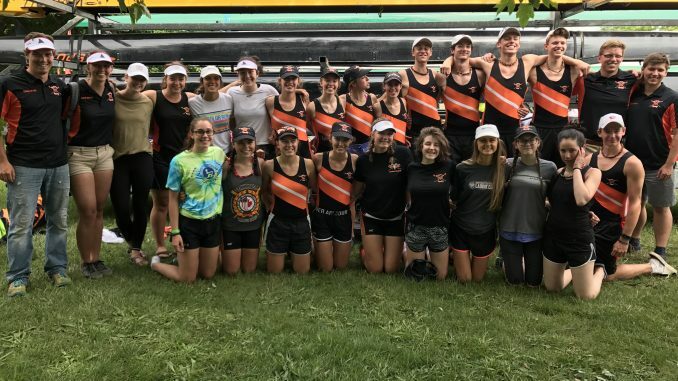 It was an exhilarating weekend for the Rockford Rowing team as they sent 3 boats and 21 athletes to face off against the best rowers from around the country in the annual Scholastic Rowing Association of American (SRAA) National Championship Regatta in Camden, New Jersey. The sun shone brightly and the wind stayed at a minimum on Friday and the Ram fans were thrilled to see all 3 boats make it out of the heats on and go on to race in the semi-finals on Saturday. Rockford fans were able to watch and cheer alongside the parents at the finish line via the livestream. The women’s Junior Varsity 4+, was favored to do well at nationals this year after boasting a first place finish at their Midwest qualifier on May 10. Junior rower, Elaina Loveless, who stroked the boat all season was unable to compete at nationals this year, however, the team felt confident that replacing Loveless with sophomore, Abby Johandes would position them well to still compete at a high level. Senior Coxswain and captain, Kirsten Brinkmeier stated that Johandes’s “technique is very strong” and on the water that helps to make up for any power differentiation the boat may lose with having Loveless out of the boat. The girls proved that theory correct on Friday as they came out of their first heat with a dominate first place finish, putting them in a great position going into semi-finals the next day. The competition however, proved to be very tough as the girls rowed their hearts out on Saturday’s semi-final race and came in 5th, ending their scholastic season with an 10th place national ranking. The girls were smiling as they came off the water and felt that they had a great race and were proud of what they accomplished this year. In the Lightweight category (under 130 pounds for women) the number of entries allowed the 8+ boat to skip heat racing and go straight to semi-finals on Friday. After a hard fought race, which included a high seated boat going off course and being disqualified, the girls were able to keep their cool and race through the confusion into a strong second place finish. The Lightweight 8+ boat was the only Ram boat that made it into the grand finals, Saturday afternoon. 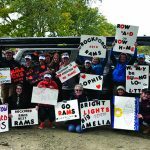 The girls ended their scholastic season 6th place in the nation, earning them a spot on the Rockford Ram’s Nationals banner which hangs in the boathouse. The Lady Rams were thrilled to make it to finals and were happy with their final race, coming off the water in high spirits. On the men’s side, the Varsity 4+ made up significant time from their Midwest qualifier (where they placed 4th ) and came on strong in the heat races to show their competitors that they deserved to be facing the fastest boats in the nation. Senior rowers, Anderson, McKee, Bigelow and Wadlow, along with their coxswain and team captain Cammi Perrini finished first in their heat, by open water. This allowed their boat to go straight to semi-finals on Saturday, skipping the repercharge round where all the second and third place finishers fought for a spot in the semi-finals. The boys and their coxswain were hoping that by skipping repercharge and only racing one race on Friday, they would position themselves well for their semi-final race on Saturday. Coach Tucker Anderson was feeling optimistic that the V4+ would make it to finals, after noting that they were seated 3rd going into semi-finals. The boys raced through nerves and whitecaps in their semi-final race Saturday morning and even though they boasted higher times than a few of their competitors they were not able to finish in the top 3, missing the 3rd place spot by less than .5 seconds. Their 4th place finish sent them to the petite finals on Saturday afternoon, where they finished in first place earning them the title of 7th fastest V4+ boat in the nation. Upon exiting the water, they learned from their coach that their finishing time in the petite finals of 4:58 placed them as the 3rd fastest boat in the nation and had they had chance to compete in the finals, they would have beat out the bronze medal winner who had a time of 4:59. However, even although they didn’t get the chance to walk away with a medal, Coach Anderson was proud of how much improvement the boys showed in the last few weeks in order to boast that fast of a finishing time at the SRAA championship regatta. 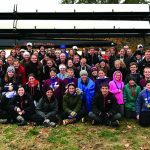 Both coaches gathered the team together at the end of the day, and as parents snapped pictures, the coaches told the kids, “All of you are among the fastest rowers in the country. You all should be proud, you worked hard all season and you earned this. All three boats placed in the top ten and that is amazing”. Although the rowers scholastic season is over, many of the athletes will get the chance to compete one more time next weekend as they head to the beautiful shores of St. Charles, Ontario where they will once again compete at a high level facing off against not only the best the US has to offer, but also the best rowers in Canada at the Canadian Secondary Schools Rowing Association (CSSRA). 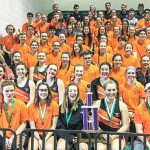 The school boy regatta, as it is affectionately called, is a great way to end this amazing season which boasted an overall state championship, a gold medal winning boat at Midwest and a strong showing at Nationals. For a relatively small team, this group of hard working kids has made the Rockford community proud.